Racing at unstoppable speeds on those tracks in games like Project Cars or Gran Turismo is the absolute thrill every gamer seek! Do you think your regular controller is enough? 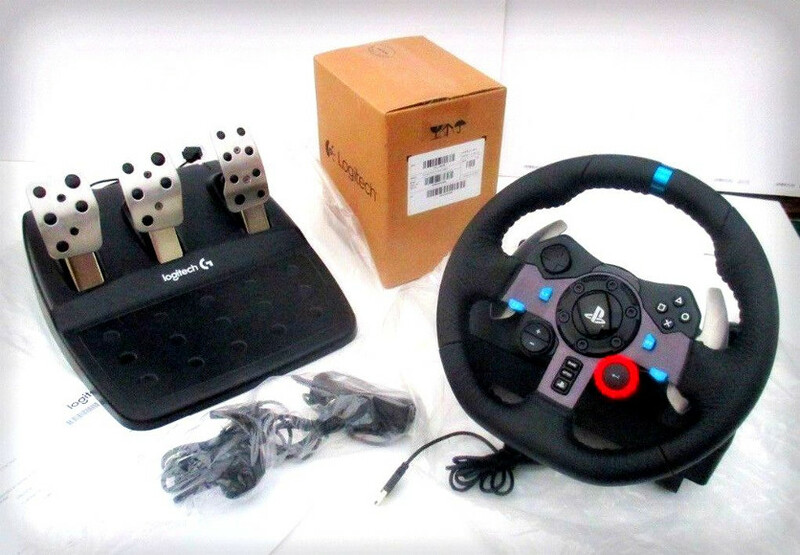 Get one step closer into racing games with steering wheels for PS4. Today, we are bring to you the best steering wheels for PS4 in 2019 with detailed reviews and some exciting offers too! Here’s the thing. Most of the time while playing driving games on PS4, there are some races that you lose by split seconds, no matter how hard you push to buttons on your console! To get more realistic control over your supercharged car, you need a more realistic setup than just a basic gamepad. Enters PS4 Steering wheel or racing wheel as some gamers like to call them. A separate steering wheel adds a lot of things to your gaming experience giving you a lot more control and an increased immersion in the race. A typical racing wheel for PS4 has a full-size wheel to steer, pedals for clutch, brake and accelerate and some of those even have paddle shifting mechanism to change gear while you game. That’s almost gonna feel like you are actually driving! Why choose a Steering Wheel for PS4 over a gamepad? While a gamepad does it’s work almost fine when it comes to just control, but, if you are someone who wants a fuller controller and gets deep into the action, a sim steering wheel is your thing! How? Let me tell you. Well, the key is ‘force feedback technology‘ that is embodied in a proper racing wheel. They are equipped with powerful motors that will make you feel like driving a real car all the time. You feel it when you jerk into someone’s car or that extra force while cornering on a difficult turn and even the drift. All these feedbacks from the steering wheel gives your brain the extra information. It helps your brain to gain ultra-fast reflexes and has an edge over the competitors playing with the basic gamepad. Not only that, you’ll be able to control the acceleration and gears manually without depending on the logic-based automatic shift and accelerate available in most of the racing games like Drift, GT Sport etc. Well, I think you won’t hesitate in spending a few extra bucks for all the thrill you want in your racing games. But, you need to know which is the best steering wheel for PS4 at the best price. Don’t worry, we got you covered. First of all, have a look at the list of best steering wheels for PS4 that we are going to cover in this roundup. Here you go. 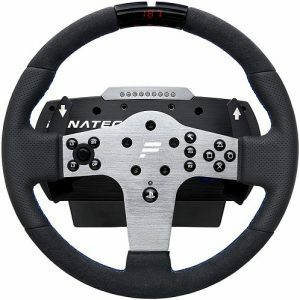 To let you better understand what each of these gaming steering wheels have to offer, we did a separate performance review of each of the racing wheels on this list and found there highlights, pros and cons. After reading these reviews, it will be very easy for you to choose what suits the best to you. So, let’s get straight to the individual reviews for best steering wheels of 2018. Probably, you already know that Logitech is a well-known name when it comes to computer accessories and their gaming products are definitely one of the top-notch ones. 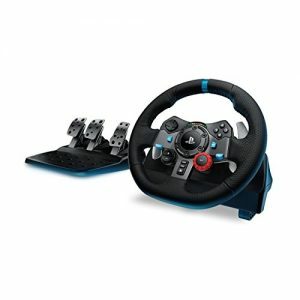 Same is the case with the Logitech Driving Force G29 Steering Wheel for PS4. Although they have another variant for Xbox too, but we talk about the PS4 variant only. This steering wheel is the ultimate you can get in terms of the whole package along with the pedals. With incredible force feedback with dual motor, re-mappable wheel-mounted buttons and anti-backlash helical gearing technology for smoother steering, Logitech G29 gives all that you can ask for. As far as turning is concerned, you get a 900-degree rotation which quiet enough to steer your cars even on the sharpest turns in most of the racing games. Not only the wheel but the pedal system also has responsive pedals for clutch, brake and accelerator; all made of steel making it quite durable. Though, its a mid-range steering wheel for PS4, but the cost is worth if you want something that is durable and has the features. 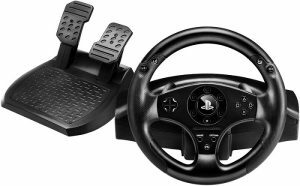 Specially Designed for PS4: Logitech has specifically configured Driving G29 steering wheel for PS4 and PS3 because they have a separate variant for Xbox. With this, you can be sure, that it will give the best performance in any of the PS4 racing games. Anti-Backlash Helical Gearing : Logitech G29 Driving Force steering wheel has anti-backlash helical gearing that delivers very quiet operation with minimum noise and maximum control. The same gearing mechanism is used in actual automotive transmissions. Dual Motor Force Feedback : This steering wheel is powered with dual motors to realistically simulate every shift, slip and jerk that your car experiences in the game while cruising on different tracks and terrains. It enables you to respond to each of them and ride better. Thurstmaster is the direct competitor to Logitech and it gives more options according to the budget and requirements of the gamers. 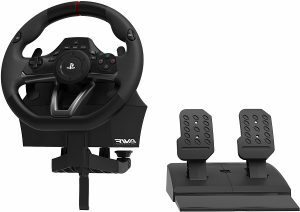 We found Thrustmaster T300 RS GT Racing Wheel to be the best from this manufacturer and that why it deserves the second place in our list of best steering wheels for PS4 2018. Let me first tell you it expensive and gonna cost you a fortune to buy. If you’re looking for budget ones, please skip this and look further on this list. But, in case you are a professional gamer and want the best out there in the market, then this is the best choice you’ll make. Thrustmaster T300 RS GT delivers super realistic force feedback, thanks to the full belt drive brushless mechanism. You will be able to experience a very smooth yet realistic response from the wheel when you turn or drift in games like Drift 4 etc. It is so real that you might hurt your thumb if you hit into a wall at wrong angles. The steering of Thrustmaster T300 RS GT is made of brushed metal and the rim where you will hold it is covered with a comfortable rubber layer. There are 13 action buttons and 1 D-Pad, all mounted on the wheel itself. You will also get two paddle gear shifters just behind the wheel. The foot pedal system that comes with this PS4 racing wheel consists of shining metal pedals adding a classic touch to it. If you ask me personally, Thrustmaster T300 RS GT is ideally recommended for any of the serious gamers out there who are willing to empty their pockets for this beast! 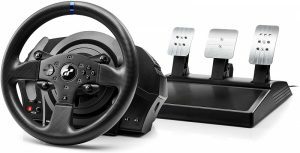 1080 Degree Rotation : Thurstmaster T300 RS GT features the racing wheel that allows a full 1080 degree rotation which is incredibly responsive and super-smooth steering. Detachable Steering Wheel : This steering wheel for PS4 has a unique Thrustmaster Quick Release system that allows the wheel to be removed with just a click. This enables you can use multiple racing wheels on the same base. Dual Belt System: It is powered by new dual belt friction free optimized mechanism that delivers ultra-smooth and quiet force feedback. It also makes the steering very much responsive and realistic. GT Edition Pedal Set : It features a special GT Edition T3PA Pedal set made of 100% metal having adjustable height and spacing and the brake pedal has progressive resistance. When it comes to gaming, Fanatec is a reliable brand and it released racing wheels for all gaming platforms including Xbox, PC and PS4. And, the third one of our list of best steering wheels for PS4 is Fanatec CSL Elite Steering wheel. Going by the design, Fanatec CSL Elite gives a run for their money. While most of the racing wheels are somewhat toyish but this one has a legitimate look. You will get a real car steering with the 30 cm diameter wheel and rims covered in premium leather and suede fabric for maximum comfort. As far as the force feedback is concerned, Fanatec CSL Elite PS4 steering wheel is powered by a brushless servo motor coupled with a single belt drive providing impressive and strong force feedback. You can also customize the strength of feedback to your comfort level. Larger ball bearing is used to reduce the friction and give you an ultra smooth 1080 degree rotation while your steering through the cars or off-roading in Dirt. A lot of customization options are also available in Fanatec CSL Elite. But, all this comes at a not very affordable price but regular gamers must try these to know the difference between these and a simple gamepad. ClubSport Technology : This racing wheel uses a superior ClubSport technology and uses the same servo motor, electronics and the power supply for the base making the force feedback much immersive. DirectSensorTM : This is another technology that you won’t find anywhere. Fanatec CSL Elite racing wheel has sensors mounted directly on the steering axis that ensures precise steering input to the game you’re playing. Fanatec Tuning Display: You can customise almost everything using this rim mounted display including the strength of force feedback, steering angle, brake senstivity. There are five different profile settings you can opt. At the fourth place on our list of best steering wheels for PS4 stands the Thrustmaster T150 Force steering wheel. If you loved the Thrustmaster T300 RS but could not spend that much, we bring you an affordable variant with almost equal features. Most of it’s design elements, chipset and button panel is borrowed from the T300 variant. The wheel and the base are made of toughened plastic and the rim where you’ll hold the steering is covered in rubber making it comfortable and less sweaty. With 1080 rotation, Thrustmaster T150 steering wheel for PS4 uses Immersion Touch Sense technology. It lets you feel almost everything happening in the game including the terrain, loss of grip, bumps and impacts etc. The pedal set has a comparatively wide footrest and has two pedals for braking and acceleration. You will get progressive resistance on the brake pedal and you can adjust the inclination of the pedals too. Overall, considering all the features and compatibility Thrustmaster T150 is the best budget steering wheel for PS4. So, if are seriously looking to buy a good steering wheel at a fair price, go for these without a doubt. Immersion TouchSense Technology: The drive system of Thrustmaster T150 uses Immersion TouchSense technology that provides unmatched force feedback. It also features Optical reading with 12-bit resolution to read steering response. Upgradeable : The internal memory and firmware of this racing wheel can be upgraded that means you can improve the performance even more. Multi belt-pulley System : Thrustmaster T150 has an advanced multi belt-pulley system which provides completely smooth, fluid and quiet. We found it less noisy than the ones with helical gears. Are you a Gran Turismo addict? If yes, we have got the coolest thing for you – Thrustmaster TGT Steering Wheel for PS4. This special edition racing wheel from Thrustmaster is specifically made for the Gran Turismo. I would ask you to just stop everything an look the design of this steering wheel. You just fall for it, I bet! Actually, it is customised so much that it looks completely like a real race car wheel. Above all, there is official Gran Turismo branding too. TGT steering wheel is equipped with a T-40VE brushless motor which gives remarkable linear force feedback and stronger response. 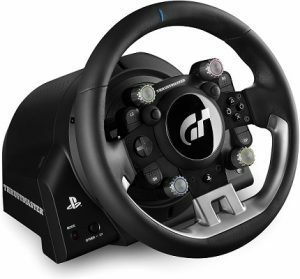 The racing wheel lightweight and provides a 270°–1080° rotation for best control in Gran Turismo. Along with 25 other action buttons, there are four custom rotary selectors just like the controls you get in the Gran Turismo game interface. But this does not stop you from playing other PS4 racing games with this. Again, just the Fanatec CSL Elite, this is one also quite expensive but if you intend to play Gran Turismo with the best possible performance, no other racing wheel will give you that. T-40VE Motor: The T-40VE motor in this steering wheel provides powerful 40-watt LINEAR brushless Force Feedback and superb dynamic torque i.e from long stall curves to super-responsive S curves. Motor Cooling Embedded system : Thurstmaster TGT has a unique cooling system for the motor which maintains linearity, 4 times greater stall force and silent performance. H.E.A.R.T Technology : The HallEffect AccuRate Technology provides a 16-bit resolution (65,536 values) to this steering wheel. This means ultra-responsive steering so that you don’t miss even small knick on the turns. Rotary Selectors : Customised rotary selectors are specially designed to echo what is present in the in-game user interface of Gran turismo. You must have understood that Thrustmaster is leading on this list with so many PS4 steering wheel variants. 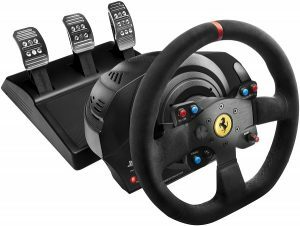 Here is another one from the leader for the Ferrari fans – Thrustmaster VG T300 Ferrari Edition! This one is actually a great mix of classic style as well as high-end features. The base of this steering wheel is taken from the T300 which is the predecessor of T300 RS GT (no. 2 on this list). That means you will get next-gen force feedback that works on a friction-free dual belt system. The angle of rotation of the steering wheel is also adjustable between 270° and 1080°. The performance is quite silent and smooth combined with strong feedback. Talking about the racing wheel, it is an official Ferrari-licensed replica of the steering used in Ferrari 599XX EVO. Though, it is scaled to 8:10 but still you get a large diameter of 11.8 inches. Made of brushed metal, the wheel is mounted with 6 action buttons, a rotary switch, 2 paddle shifters and multidirectional D-pad. If you are looking to buy a T300 and want to boost your love for Ferrari too, then go for this special Ferrari edition and you will have to ask no more. Licensed Ferrari Wheel : The wheel of VG T300 is a licensed Ferrari replica to the scale of 8:10 that will you the real feel of actual Ferrari in your PS4 racing games! A trademark Ferrari logo is present at the center of the wheel alongwith various control button. T3PA 3-Pedal Set : This racing wheel comes with T3PA pedal set made of 100% metal on the inside. Three separate pedals for clutch, brake and accelerator are provided and their inclination can also be adjusted. T300 Servo Base : It is equipped with a standard T300 servo base taken from its higher end brother that allows amazing force feedback, silent and smooth operation with 1080 degrees of maximum rotation. Although, the true pleasure of a steering wheel comes with the force feedback technology in my opinion, but sometimes it gets too distracting and even causes fatigue in your palms and forearms. So, if you are not a very big fan of force feedback, then Thrustmaster T80 RS steering wheel is the best option! This entry-level steering wheel for PS4 will give you the feel controlling your vehicle the actual way instead of the gamepad. It is officially compatible with all racing games on PlayStation 4. With 240 degrees rotating steering wheel, you will get a nice comfortable rubber-coated rim. All controls including 11 action button, a D-pad and 2 sequential levels for gears are present handy on the wheel. Though it lacks the advanced force feedback system but Thrustmaster’s bungee cord mechanism provides a realistic resistance while you steer. The best part of this racing wheel for PS4 is the price. You can get your own set of racing wheel and pedals at less than $100 that is significantly lower than the ones featuring the force feedback technology. Thurstmaster Bungee Cord system : To simulate real-like steering resistance, this racing wheel has Thrustmaster’s bungee cord system. It allows automatic centering regardless of the angle of rotation ensuring intuitive control over your racing car. Adjustable Wheel Sensitivity : With Thrustmaster T80 RS racing wheel, you can tweak the sensitivity of the steering wheel. It allows you to customize how the vehicle should turn when you steer the wheel by a certain angle, thus, providing better control. Central Clamping: In case you already own a gaming desk and you want to use this racing wheel with that, then you can rest assured. This racing wheel has sturdy central clamping system that allows optimal stability with any type of desk or table. The last one on our list of best racing wheels for PS4 is Hori Apex Steering Wheel. Among all the big brands like Logitech and Thrustmaster, Hori Apex Steering wheel deserves a mention for delivering a quality second option to look at. It is one of the best steering wheels in the no force feedback category. Hori Racing Wheel Apex features a full-size steering wheel which is officially compatible with Playstation 4, PlayStation 3 and even PC. The control buttons, pedals and paddles are fully programmable and you can map them to any functionality of your choice. For arcade gamers, the wheel can be set to 180-degree rotation, otherwise, it offers a 270-degree steering angle. Just like the previous one, Hori Racing Apex also falls the under the category of steering wheels under $100. Full-size Stylish Racing wheel : The wheel has a diameter of 11 inches which common in almost all the racing wheels but the design is quite stylish with comfortable grips. The middle rib is separated into two and has a silver finish to it. Quick Handling Mode : Different games demand a different level of precision. And for the same, this racing wheel allows you to adjust the rotation output between 180 and 270 degrees according to the game that you are playing on your PS4. Adjustable Pedal Response : Another handy features in Hori Apex steering wheel is the ability to tweak the pedal response. That means you can adjust the amount of pressure required to reach the full braking or acceleration. After reading all the detailed reviews of our best steering wheel for PlayStation 4, you might have come across with some questions like Do I need separate Pedals? Is force feedback going to give pain while driving? or PS4 steering wheels are compatible with Xbox or other platforms? Well, don’t worry. In this buyer’s guide, we have covered answers to all such queries and the important things you need to consider while buying a good steering wheel for your PS4. Here you go! Probably, you might have heard this term before reading this post. It is the most talked about feature of gaming steering wheels. In fact, we also mentioned these features quite a lot while reviewing the steering wheels above. Basically, it is a mechanism used in steering wheels to simulate a real-like impact and shocks to the gamer as he races on different roads and at different speeds. But sometimes, strong force feedback can be exhausting too. If you are going to buy a steering wheel for your PlayStation, look if it has force feedback technology (though most of the modern ones have it) and makes sure it is not very much strong if you game for long hours. Belt driven systems have good force feedback while the direct drive system has quite strong force feedback. It is obvious to check whether the steering wheel you are buying is compatible with your version of PlayStation or not. Though, most racing wheels are compatible with PCs but you need to make sure when it comes to PS4 and Xbox because they are not cross compatible. You might have noticed that we mentioned the rotation angle for each of the steering wheels on this list. It is because that determines the type of usage. While most of the games can be played without any issues with a 900-degree rotation steering wheel but in games featuring heavy vehicles you might need a 1080 degree rotation angle to effectively steer them around. Having a clutch is a plus point in my opinion because it allows more control on gear shifting as well as the more realistic feel of a race car. Though most of the newest racing wheels kits do not feature a clutch, but it can be bought separately. Again, there is some extra budget involved. Will a ps4 steering wheel work on PC? Not all the ps4 steering wheels will work on PC. But definitely there are many models available in the market which does require a little software upgrade to be fully compatible with your PC. One such great example of the Steering wheel that also works on PC is Logitech G29. 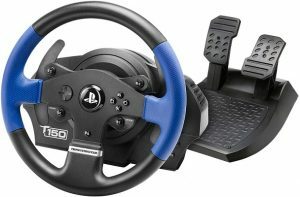 Conclusion – Which Steering wheel is best for PS4? So, fellow gamers, I hope you must have found the perfect fit PS4 steering wheel for yourself after reading our ultimate guide of best racing wheels compatible with PS4. There is no doubt that a good quality steering wheel is definitely going to enhance your experience in racing games like Forza, Dirt, Gran Turismo and more. Though it is not very easy to shift from a simple controller to a racing wheel. And it is possible that during some initial games, you fail terribly. But that’s not your fault. After practicing just a few hours, you gonna love your decision of buying a steering wheel for PS4. We tried our best to present all kinds of options to choose from. 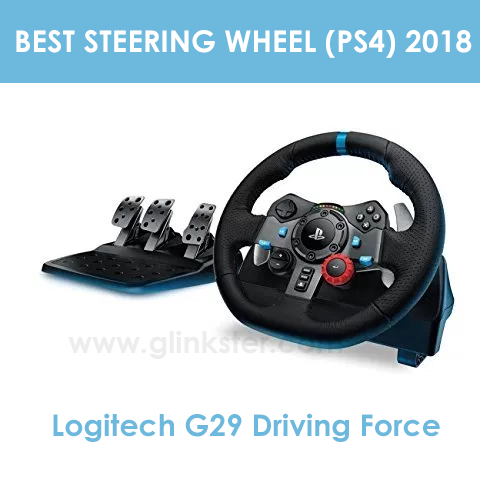 Glinkster recommends Logitech G29 Driving Force steering wheel to be the best overall steering wheel for PS4. While Fanatec CSL Elite is the most advanced steering wheel (most expensive too) on this list. Thrustblaster T150 RS proved to be the best budget steering wheel for PS4. And, Hori Racing Wheel Apex is the cheapest steering wheel you can buy. So, that’s all from our side. I hope you have liked this post, if yes, don’t forget to share it with your gamer clan! Share your views about this post in the comments section below. If you have any doubts or still confused which steering wheel to buy, feel free ask in comments. I will try to help you out in every possible way. Cheers!